SFBW has been writing about hedge funds and other financial service companies moving to South Florida since a major story in early 2015. Now, the new tax legislation is spurring more people in places such as New York to think about moving, according to a post on the Palm Beach County Business Development Board website. The reason is the tax legislation curtails the deduction of state and local taxes to $10,000. Some wealthy New Yorkers save $100,000 a year under the old rules. Kelly Smallridge, the BDB’s president and CEO, says she has received 20 to 30 serious inquires about relocation in the past couple of months. A March SFBW article told how Michael Corcelli, the founder and president of the Florida Alternative Investment Association, has seen the number of its members double in the past three years. South Florida is home to more than 200 family offices, almost 20 private equity firms and more than 50 hedge funds, according to the Newlink Group in Miami. Palm Beach County’s Business Development Board last year put the numbers even higher, with an estimate of more than 300 hedge funds and private equity firms in the three-county area. Obviously, those running hedge funds can make huge salaries, which help fuel sales of high-end homes, luxury goods and upscale restaurants. 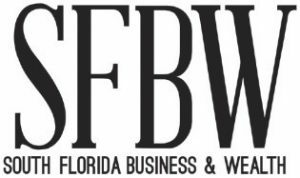 These relocations also are good for the professional service ecosystem in South Florida, as shown in SFBW’s December article about Eisner Amper expanding in the region.